Volkswagen India is all set to launch the new Passat in India next year, but the German car maker has started testing the car in the country. 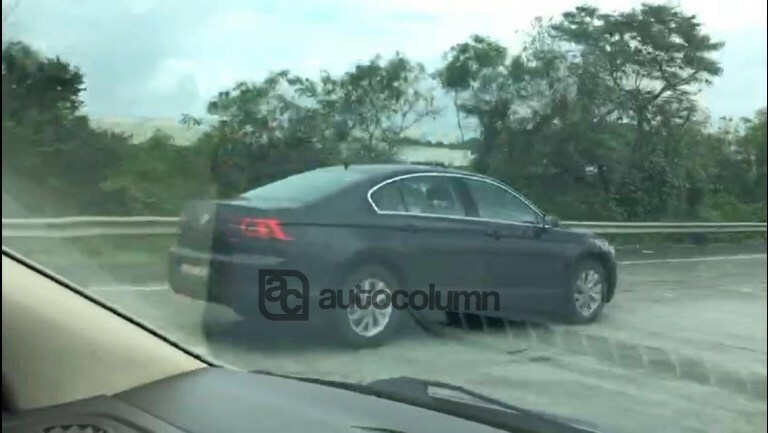 A test mule of the car was spotted at the Mumbai-Pune Expressway recently by AutoColumn. The new Passat is based on the MQB platform helping it be lighter. The slimmer headlights, a more substantial four-bar grille, and a restyled muscular hood all work together to give the Passat a wider, more planted stance from the front. In the rear, she gets a premium European-style flush rear license plate area. A new chrome strip on the trunk makes the rear lights appear lower, enhancing the grounded appearance, while chrome on the window surrounds, bumpers, and door trim adds to the premium nature of the design. Incidentally,the version shown at the Auto Expo was the petrol hybrid GTE variant. This gets a 1.4 litre TSI petrol mill and an electric motor, helping the combined output to stand at 218 bhp. The report, however, adds that the car spotted had a 2.0 TDI badging. That’s the same engine present in the previous generation. Now we do believe that the GTE version will be introduced but it makes perfect sense for Volkswagen to launch a fully diesel driven model as well. The German automotive giant was recently stuck in a big controversy regarding emission but the brand is slowly emerging from it. Sales volumes and share prices have not been hindered. In India, they have launched their first sub 4 metre compact sedan with a petrol mill. Called as the Ameo, the car is set to gain a diesel mill soon.